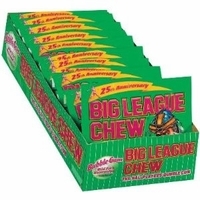 Big League Chew Watermelon Gum. Springtime, Summer, Baseball, and Watermelon. What a combo! Big League Chew Wild Pitch Watermelon is out of control flavor wrapped up in a big, juicy shreds of bubble gum. Packaged up in a cool foil pouch to keep it fresh just like the Big Leaguer's chew. Scramble back to the wall to catch this one. Chew on the long lasting flavor. And no spitting.